I've been having fun lately thinking about the differences between teaching in an elementary school and teaching in a high school. I haven't taught in an elementary school in a while, but I have fond memories of colorful displays on the wall, interactive activities, group work and games. So in an attempt to engage some of my senior students who aren't as interested in school as I'd like, I'm having fun integrating some "elementary teaching techniques" into my classroom. And... believe it or not... we're having a ton of fun and I do believe that there's some real learning happening as a result! My next few blog posts are going to highlight some of the tips and tricks I've been implementing lately. Best of all... most of these techniques are easy, take little prep time and don't cost very much (if anything). 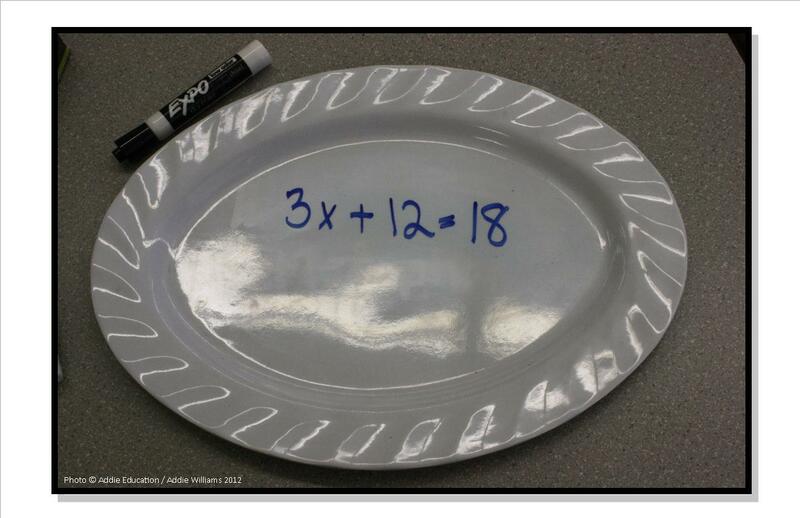 I've seen lots of different ways to create individual whiteboards lately on all sorts of websites... everything from laminated paper to plastic picnic plates. After a bit of trial and error I've discovered that the white plastic (melamine) platters from my local dollar store work the best! I have a set of 20 in my classroom that I mostly use for group work and a review / quiz game. My students (especially the boys) love them! I often play a game where I ask them to draw and explain a concept - they work in groups and I love listening in on their conversations as they figure things out. As well, the students like the fact that I'm not looking for something technical, just a quick and easy explanation of an idea or theory. - I'm sure the list is endless! I quickly discovered that white board erasers are very expensive ($5.00!!!) so I went to the Dollar Store (what did we do before they were around??) and bought a child's fleece scarf and cut it up into 8 little "fleece erasers". They work really well and every once in a while I bring them home for a wash. I store the plates, pens, and erasers all in a plastic bin that I got at (you guessed it!!) the Dollar Store! Anyone else use these or something similar in their classroom?? I am loving all the ideas for individual whiteboards. I have not yet decided on what I am going to use for them but I certainly plan on doing something! I like these ones because they're sturdy and don't bend / crinkle / smush like the picnic plates I've seen being used. Also, because they're "platters" there's a little more room to write. Good luck finding one that works for you! For erasers I use child socks!!! My 2nd graders have the marker in one hand and the other hand is in the sock! When it is time to put away the marker goes into the sock for safe keeping. Glad to hear high schoolers enjoy this tool. I'll have to check them out since my white boards are getting scratched up! I love the idea of little socks!! How cute! I love how big kids like things like this too! In July and August you can usually find marker boards for $1. The dry erase markers still erase well on them. Thanks Heather! I'll visit your blog today... I love using ideas for little people with my big ones! I call it "Two Truths & A Lie" and I play it the first week of school... it's hilarious. Thanks for the tip! I am a high school teacher and the BEST ideas come from the elementary school teachers. High school students love these things. Depending on your desks, there are some desks that are actually "dry-erasable". My students love when we do activities where they can write/draw on the desks. I like how the platters look! A desk that's erasable would be amazing! 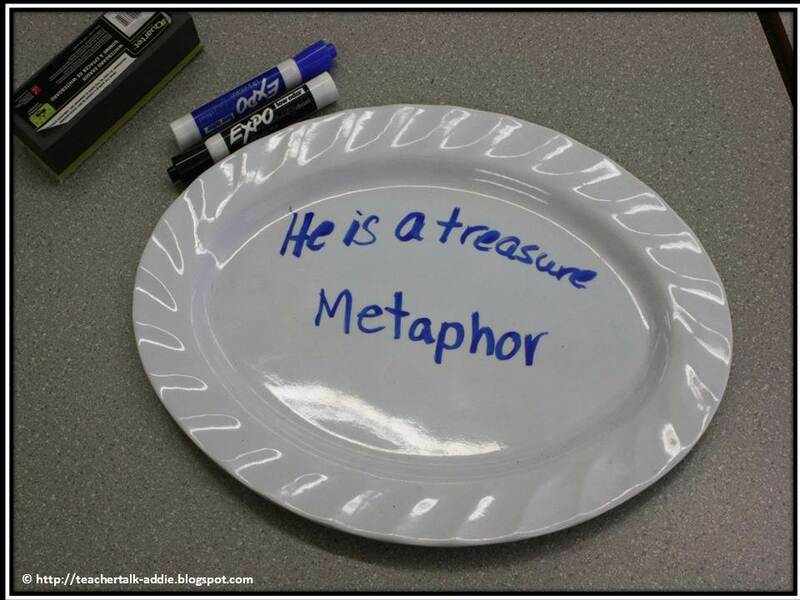 I can see that students would love being able to write on their desks. Wow... I Can't Believe It!